The appeal of vintage Singer sewing machine cabinets resides in their history, decorative design and versatility. They're often refurbished to make desks and other furniture. 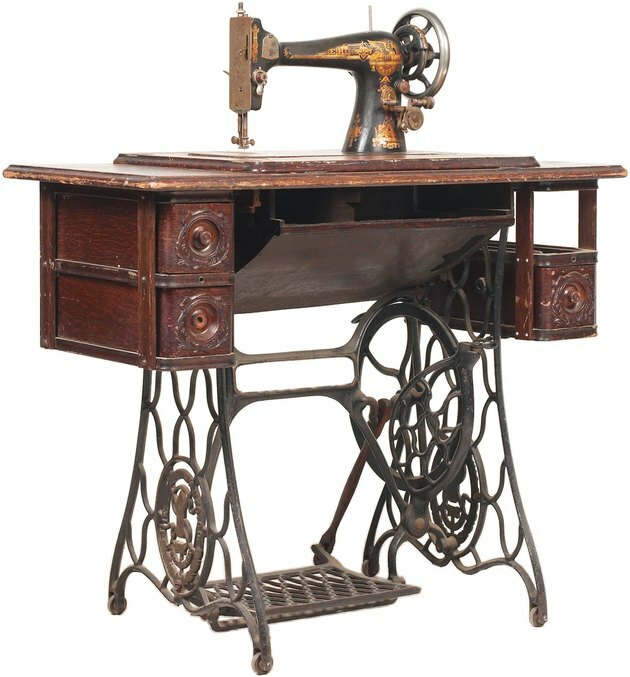 Old Singer cabinets were made of real wood with carved drawers and intricate treadle metalwork. You can restore an early sewing desk's surface with a cleaning that will maintain the wood's original finish and preserve its integrity. Restore a vintage Singer cabinet to its former glory by restoring its original finish. Mix the soap and water according to the manufacturer's directions in one bucket. Fill another bucket with clean water. Dip a soft cloth into the soap, wring it out and gently rub it over the surface of the cabinet. Clean any carved crevices with a cotton swab. Periodically change cloths as they become soiled. Rinse out a fresh cloth with clean water and remove any surface residue left by the soap. Wipe down the cabinet and allow it to thoroughly air dry. Rub the steel wool gently over the cabinet to remove any dullness in the wood. Dry dust the desk. Fill in any scratches on the cabinet with the wood-filler crayon or touch-up pen in a matching color. Smooth the oil-based polish over the wood with a clean cloth and buff with a dry one to a fine luster. Maintain the finish by cleaning regularly with a good-quality furniture polish.